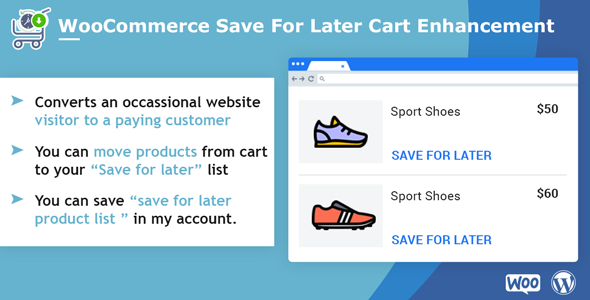 WooCommerce Save For Later Cart Enhancement plugin allows to customers to save particular product and keeps them saved for later purchase. It will help those customers who have to leave your site without purchased some short-listed product and added into the cart, but total cart amount is out of budgets for customer. So Customer will put some product in save for later section. It will remove from the current cart and It will save for later section.When customer will purchase product next time from your website with same browser then It will show (save for later product) item in cart page. It will remind them of the purchased product. It will increase your sales by this features. How Save for Later Works? Allow guests as well as logged in customers to save products for later on the Cart Page. Show them these products the next time they visit the Cart Page and increase your chances of selling these products. Let guest/ customers save unlimited products. The biggest advantage of this feature is the customer need not LOGIN. No setting or configuration required. Just install, activate & forget. your visitors move products from their cart to their "Save for later" section. Single click you can add save for later product in cart page OR delete save for later product. Save for later product will show on cart page on next time purchase product from the same browser. you can save for later cart product in my account.